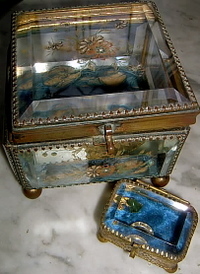 Entries categorized "Victorian Beveled Glass "
Here are a few more of my antique boxes. 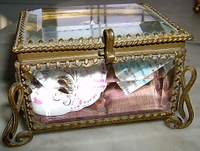 I started out posting just my beveled glass boxes. As I started poking about however, I came across a few others. "Oh yeah, I forgot about that one." The very first box with the shredded blue lining is actually pretty large in size compared to my others. These boxes used to be so hard to find. I'd be lucky if I came across 1 in an entire year. Let alone one that I could afford. This was all before Ebay of course. At any given time there are any number up for grabs. Competition is usually fierce however. Most of my boxes are fairly common. Trust me, there are some spectacular, very elaborate boxes out there. 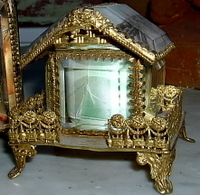 Actually, come to think of it, I have a thing for beveled glass period. And beveled mirrors. 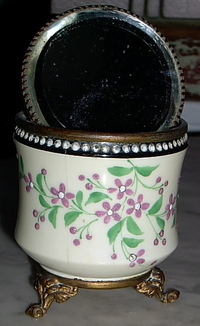 Apparantly I'm susceptable to antique beveled anything. If anyone ever reads this who knows even a little something about these beveled boxes in particular, PLEASE let me know. 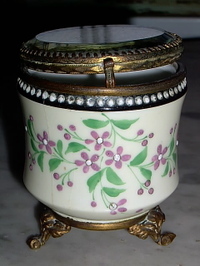 I think that they originated in France but I'm not sure. I've seen pictures of beautiful French doll carriages dating back to the 1870's with similar tufted linings. The glass box with the unusual twisted legs I purchased from a wonderful, magical little store in Barcelona about 13 years ago. Spotted it as I strolled on an ancient narrow winding street. Sigh...I've also seen these for sale in Rome. For like $200-350 each I might add. 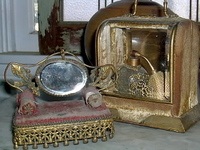 The third picture is of what I think was originally a box made to hold perfume? 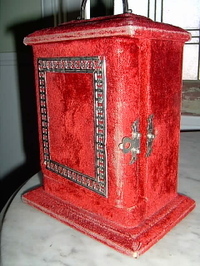 Oh yeah, another "thing" I have is for anything with original Victorian velvet. No, correct that. Antique and vintage velvet period. I love silk velvet from the 20's to funky groovy printed velvet from the 60's. Oops. I degress...Back to the red box. It's lined with light blue silk. Kind of a goofy choice but I had to possess it anyways. Photo number 4 shows the inside. I stuffed it with some bits & pieces (Austin Powers) that I had hanging about. 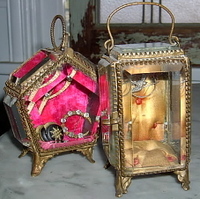 The box with the bright pink velvet (that was added by myself) was found in a thrift store in Long Beach, California for like $3. Thought I was going to have a stoke when I spotted the price tag. Y'know that heart-starts-pounding-I-think-I-might-score feeling. It's missing its back which may or may not have been glass at one time. For $3 I sure don't mind. The teeny tiny round one is one of my faves because of its size. 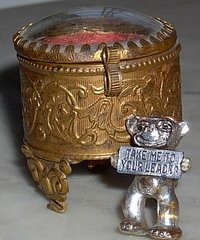 That "take me to your leader" pin propped up in front of it has been in our family since forever. It's one of those things that my mother seems to have always had in one of her cases. 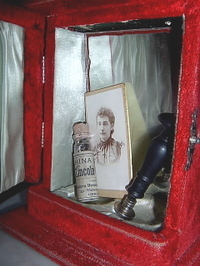 She always had these cases just crammed with little bits and pieces, odds and ends that she picked up. Growing up I would stand for what seemed like eons and just stare. Always spotting something new and that I hadn't noticed the last time. Sorry mom but sometimes I thought you were goofy for doing this but what do ya know? I turned out the same way. I guess goofy is in our blood. She also has a small white plastic Gandhi. We always joked that it looked like my dad in his shorts.